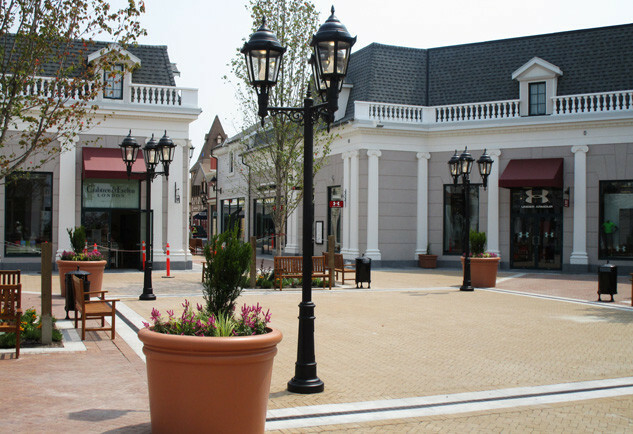 McArthurGlen YVR Designer outlets: lighting with style and functionality. 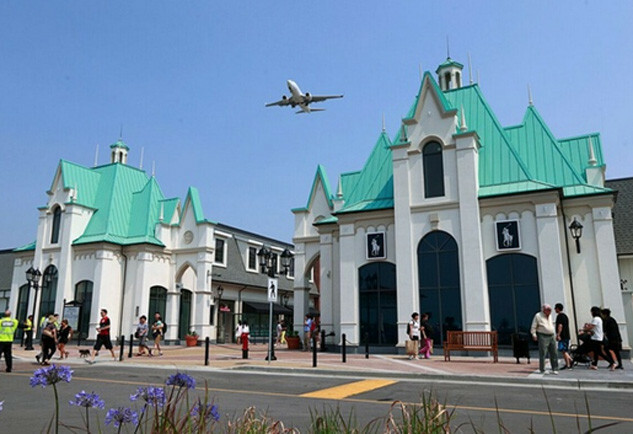 McArthurGlen Vancouver Airport is an exciting luxury shopping destination located on YVR’s Sea Island. A 50 per cent owner, Vancouver Airport Authority formed a joint venture with McArthurGlen Group, Europe’s leading developer of luxury outlet malls, to develop the centre. The project’s architecture is bringing the sophisticated European style to Vancouver, and blending it with a style that reflects the local heritage paying tribute to several well-known Vancouver neighbourhoods, in particular the distinctive brick facades of the city’s historic and vibrant Gastown district. 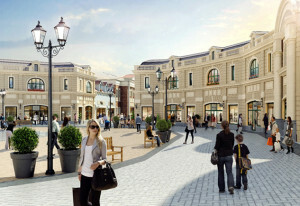 The designer outlet has been designed in an open-air village style, with pedestrian-friendly walkways, tree-lined streets, a dancing fountain, gentle landscaping, a luxury piazza and a variety of façades. Restaurants, cafes and open-air seating areas will complete the leisure experience, while a children’s playground and on-site entertainment will cater for all the family. Quattro was invited by Houle Electric, BC’s most trusted name in electrical contracting, to partner in this Design-Built project. Quattro’s involvement started with the lighting design, architectural integration and product development. The lighting system went through the design phase and the Airport Authorities’ lighting performance and sample approval phase followed by manufacturing, installation and complete turnover. The Airport Authority has a long-term goal to improve energy efficiency at YVR and commenced work in 2014 on a long-term energy plan for the airport. The Airport Authority received in 2014 the BC Hydro Power Smart Leadership Excellence Award in recognition for their implementation of energy-saving projects including smart lighting and improvement of the existing operational and maintenance procedures. The Authority is also very sensitive to light pollution and reduction and wish to control light levels to reduce impact on surrounding communities. The challenge was to compose with the high level lighting requirements and the architecture integration of the European Style urban furniture elements. 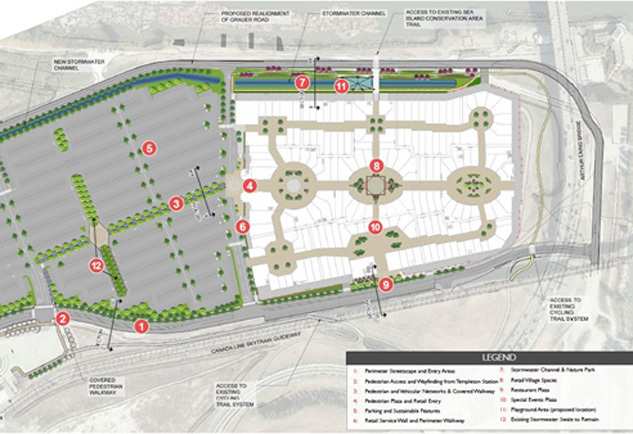 Transport Canada lighting codes requires a 50 lux maintained average and a 4:1 uniformity ratio for all pathways and plazas surrounding the airport. It was imperative in designing the lighting project to create a perfect equilibrium between performance, comfort, efficiency and architectural integration. Considerations were taken to minimize lamppost quantity and to find judicious placement and to eliminate the glary effect of the LED engine in the lanterns. It was imperative to Quattro to present a product that would add value to the surroundings and bring a positive feeling creating a vibrant shopping environment. Working with the proposed streetscape and the adjoining building’s façade, several iterations of photometric study were performed using single wall mounts units, twin head and triple head lampposts. 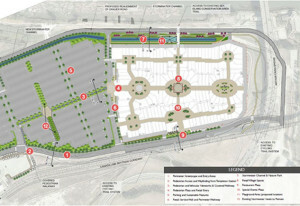 At this critical stage the objective is to make accurate photometric predictions: by computing the illuminance with the project specifics, Quattro’s designer optimizes the luminaire LED engine selection and power, its placement and aiming, and validates adherence to all lighting criterions. Noting was neglected to enhance the understanding of photometric performance. Visualization is extremely important to comprehend changes in luminance for different materials and surface properties and predict the effect of various lighting designs in real-world, light and surface interaction. 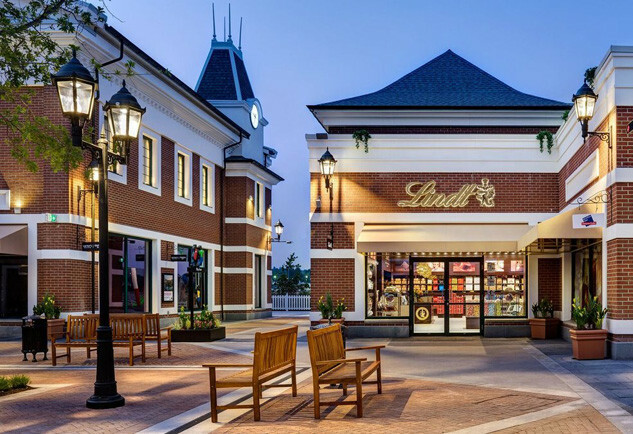 A total of 133 wall mount units, 7 single head lampposts, 5 doubles and 21 triples were used to complete the lighting design and adequately fulfill all lighting criteria. Quattro AF4A-9-SB120-BKST-QSP4849E pole is a decorative type aluminum fluted pole and structural decorative base. Timeless product that can accept lights from modern to contemporary style. The QM101 arm is available in Wall mount, post-top single, double and triple head assembly; embellished with a discrete decorative scroll element. Finesse, lightness and elegancy make this set a unique product that will cross the years without a wrinkle.